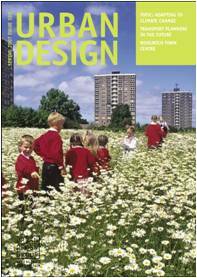 This issue of Urban Design takes up a theme that emerged from the special 100th edition of Urban Design – climate change and how to adapt existing places to weather extremes. The Topic Editor Gerry Metcalfe, Knowledge Transfer Manager at the UK Climate Impacts Programme at Oxford University has drawn together articles from seven collaborating organisations to outline current best practice from research projects. The issue sets out what the changing climate will involve in the 2020s, 2050s and 2080s as understood by the Hadley Centre in the Met Office (known as UKCIP02) for the UK. There is also an invitation to get involved in how the next round of research on climate change is presented (to be known as UKCIP08). Polly Turton of CABE outlines its role in bringing adaptation issues to the forefront of design and regeneration; Liz Greenhalgh describes the importance of green spaces in helping cities to adapt to hotter drier summers and warmer wetter winters. Michelle Colley questions whether designers fully understand the difference between mitigation and adaptation, with reference to international examples. John Handley, Susannah Gill and Sarah Lindley from the Centre for Urban and Regional Ecology in Manchester describe their research using urban morphology to understand the risks that cities or regions will face when dealing with the effects of climate change. Anastasia Mylona reports on research prepared in association with the Chartered Institution of Building Service Engineers and Arup examining six building typologies and how they will fare as the climate changes. The research tests the effects of various design options and the resultant temperatures for occupants and their future energy use. John Blanksby sets out the need for designers of new development to plan drainage systems which take account of gradual changes to development sites, so that stormwater is managed holistically, and Rob Shaw describes the changing policy context for responding to climate change and flood risk issues. The UKCIP programme has been promoting greater involvement by local authorities in addressing adaptation measures, and two features describe how this can be done. The topic culminates in a checklist for development, to help designers and planners ensure that their developments are addressing climate change by adaptation. To complement this, Sue Roaf reminds readers of the salient actions for ‘adapting buildings and cities for climate change’ (from 2005 book of the same title). Chartered engineer Richard Latcham from Peter Brett Associates, who are the sponsors of this issue, calls for a new approach for roads and transport planning – to favour people and place-making. The issues of dealing with climate change in Ireland are described by Diarmaid Lawlor, and David Cafferty and Richard O’Neill explain new ideas for the civic heart of Woolwich town centre, in addition to a wide range of news reports, events and book reviews.